Designed by Ernst Heinkel for the Austrian army in 1916, the KD (Kampf Doppeldecker), later designated Hansa-Brandenburg D.I, single-seat fighter aircraft was known variously as the Spinne (spider) and 'Star-Strutter'. Each nickname referred to the unusual interplane strutting, comprised of four small V-struts joined together in a star shape between each upper and lower wings. Flown as a prototype with the 160hp Mercedes D III six-cylinder water-cooled engine, the KD was manufactured in series as the D.I in two versions -Series 28, with a 160-hp Austro-Daimler engine, built by the Austrian firm of Phonix Flugzeugwerke; and Series 65, powered by a 185-hp Austro-Daimler, built by Ufag. Due to lack of a suitable synchronization gun gear, the D.I was armed with one machine-gun in a 'baby coffin' housing above the upper wing centre-section. Despite its shortcomings, the 'Star-Strutter' was extensively flown in combat by most leading Austro-Hungarian fighter pilots, who gained many victories in the type. Of wooden construction with fabric wing skinning, plywood fuselage skinning and having steel-tube interplane strutting, the D.I was armed with a single unsynchronised 8mm Schwarzlose machine gun which was enclosed by a fairing on top of the cabane and fired over the propeller. 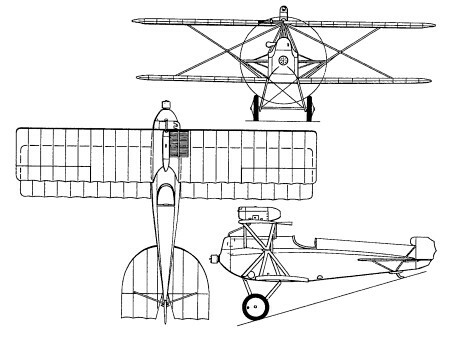 The D.I was reputedly difficult to fly, suffered inadequate directional stability owing to the rudder being blanketed by the deep fuselage, and had poor spin recovery characteristics. A number of Phonix-built Brandenburg D.Is survived World War I to serve briefly with the Deutschosterreichische Fliegertruppe. Entering first-line service in 1917, the D.I was found to have poor lateral control, and was difficult to land safely due to the pilot's forward view being virtually obscured by the bulky engine installation. Such was the D.I's high accident rate that it became nicknamed the Sarg (coffin) by front-line pilots. Until its gradual replacement by Austrian-built Alba-tros Ds and Berg D scouts in late 1917, however, the 'Star-Strutter' bore a large burden of fighter combat. Austria's leading fighter pilot, Godwin Brurnowski, comman-der of Fliegerkompagnie (Flik) 41J, had its Brandenburgs all doped in a red finish with a white skull on a black field as a unit mark.